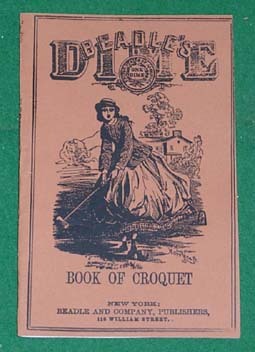 Croquet came to the United States from England during the mid-1860's. It was an outdoor sport that could be enjoyed by both men and women playing together so it was a social activity more than an athletic one. This book contains information on the equipment, the rules for play, and three different arrangements of the hoops. The game was played by up to eight players divided into two teams. Because the rules are similar to today's game, the hardest part of staging a period game of croquet is obtaining the necessary equipment. The handles of the mallets for the time period were 33 - 36 inches in length rather than the 30 inches of today.